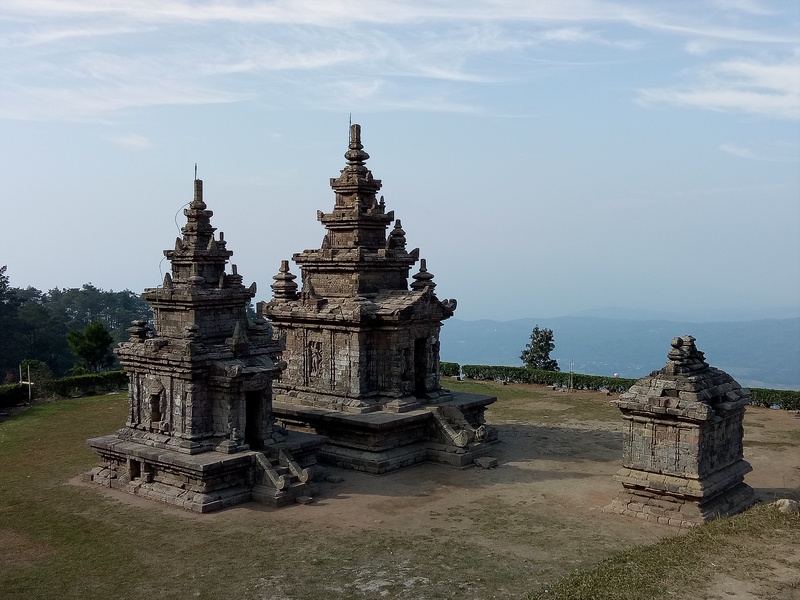 Standing like outposts on the slopes of Gunung Ungaran 2050m, Gedung Songo refers to a group of ancient shrines bearing testimony to Java’s Hindu past. 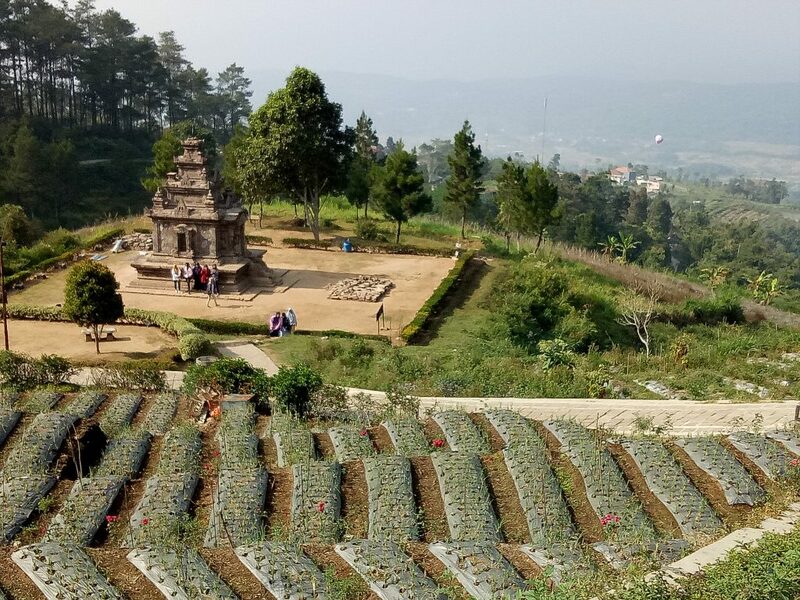 It is not known exactly how many of these shrines there were on this site originally, but archaeologists believe that there were once 400 temples on the Dieng Plateau. It is likely that there were as many over here, but there are hardly any reliable records to work on. Even the names of these shrines are unknown (they are named Candi 1, 2, 3, 4). These highly durable structures are the legacy of a lost civilisation. 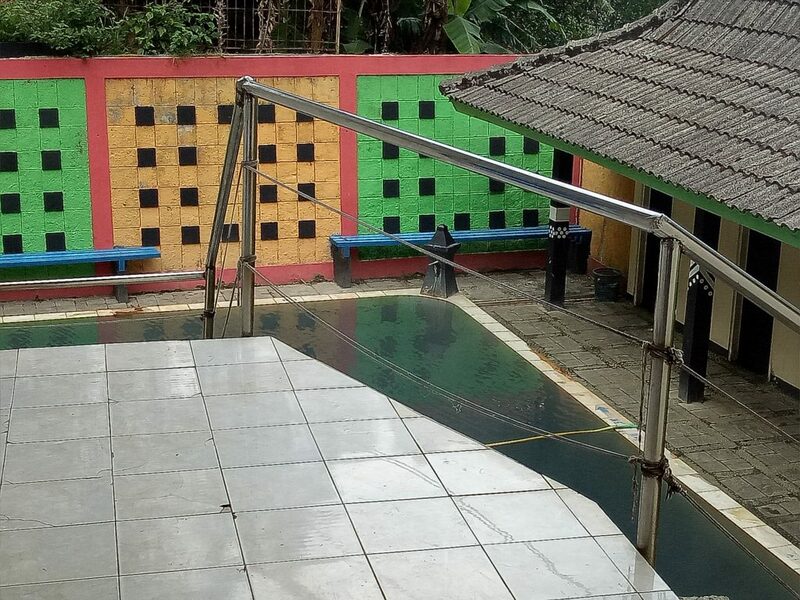 It is believed that the site at Gedung Songo was originally built during the early period of the Mataram Kingdom which controlled Central Java during the 8th and 9th centuries – more than 1,000 years ago. 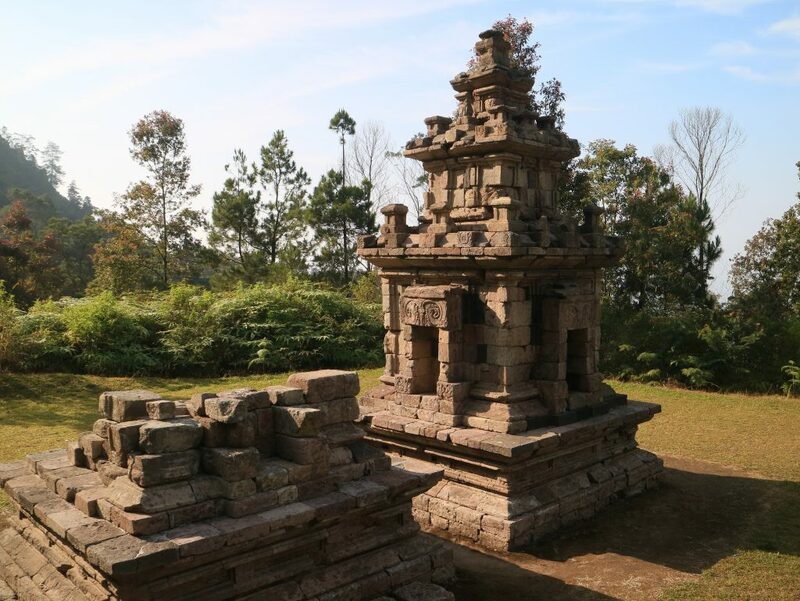 Similar to the candis on Dieng Plateau, the candis at Gedung Songo were constructed from very hard volcanic stone which is only found on some volcanoes. Unlike the temples at Dieng, those at Gedung Songo are unnamed. 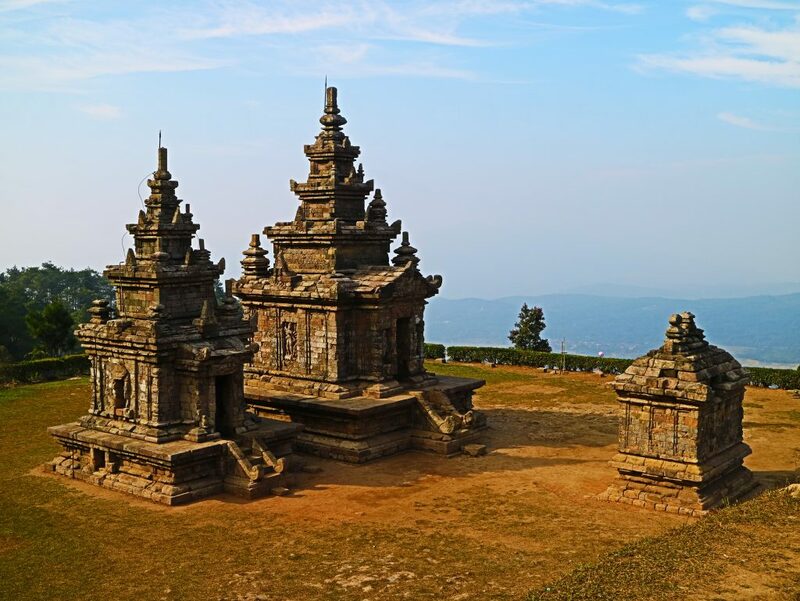 Built at high altitude, perhaps to test the endurance of pilgrims, the two sites of Gedung Songo and Dieng represent the oldest Hindu structures in Java. They actually predate Borobudur and Prambanan, and show considerable influence from Indian Hindu temple architecture. When I first visited Gedung Songo in 1997, the place was rather bare and rustic. You can say that the place has gotten more commercialised. You can also say that there are more amenities now. Apart from the somewhat unnecessary playgrounds, there is plenty of horticulture invading the slopes and terraces leading up to these spectacular structures. At different times of the day, the shrines offer different perspectives for the keen photographer. The meditative and imaginative ones can also spend an entire day and a frigid night here, soaking in the eerie and mysterious atmosphere. Wouldn’t it be nice if we could have some lights inside one of those shrines? Like at Borobudur, the exit from Gedung Songo also diverts the visitor into a maze of souvenir shops and warungs – places designed to fill your stomach and shopping bag while they empty your pocket. There are now some amenities which allow visitors to camp overnight. For food, there are many warungs within the park to fill the tummy and toilets for emptying it. For a good soak, there is also a hot spring bath. To visit Gedung Songo on a day trip, you can base yourself in Semarang or Bandungan (not to be confused with Bandung in West Java). I first visited Gedung Songo in 1997 while based in Semarang. 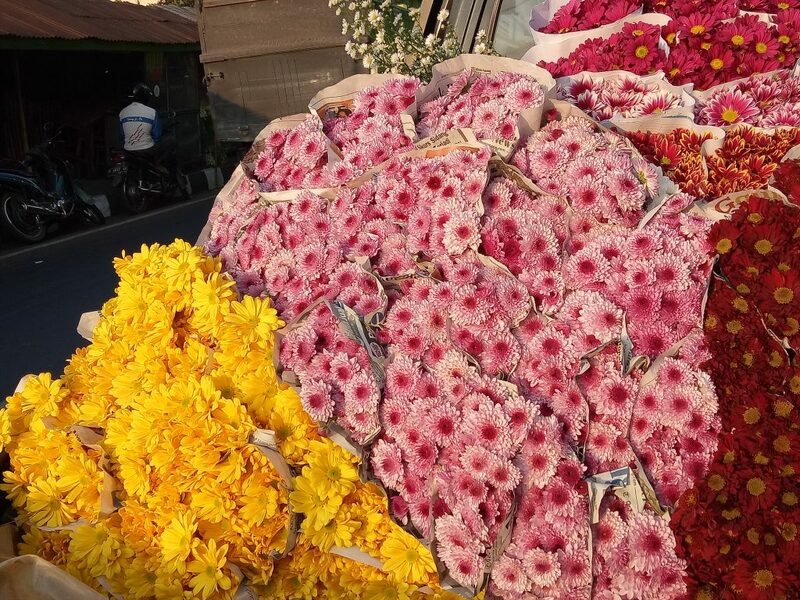 This time, I chose to stay in Bangdungan – which wasn’t such a bad idea as Bandungan is situated in the highlands, so it’s cooler, less crowded and more interesting – with its pasar bunga or flower market which floods your eyes with a dazzling display of colours. 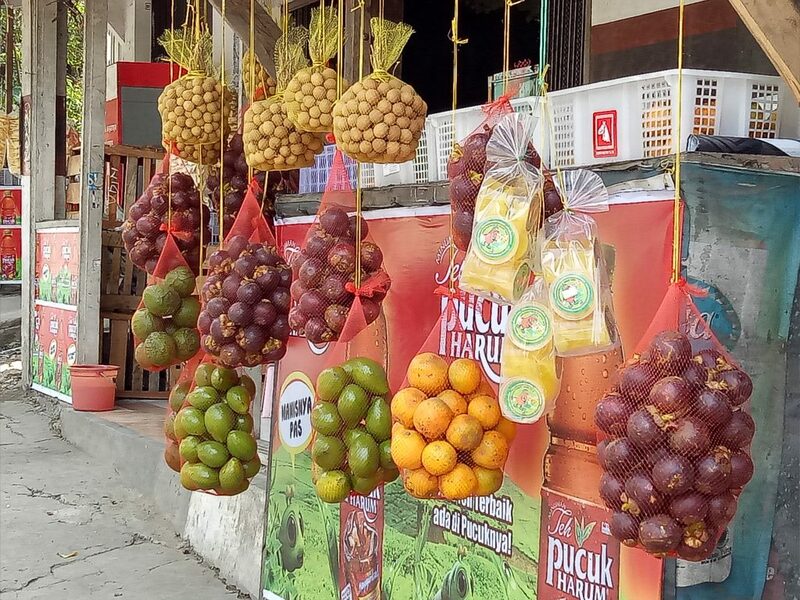 Longans, mangoesteen, oranges … Bandungan is also famous for fruits, the most interesting of which is the smooth-skinned avocado. However, don’t expect the the amenities of a city here. The hotels here are mostly basic. Those that look grand are old and poorly maintained. A little more about hotels later. From Pasar Bandugan, you can charter a minibus that goes all the way to the entrance at Gedung Songo for about Rp 40,000. If you want to save money, you get ride on a crowded angkot to the base of Gedung Songo, then from there take an ojek to reach the entrance. It’s a long way up and the ojeks may fleece you, so it may be a better idea to charter the minibus from the market, especially when there’s more than one of you to choose from. While Bandungan is pleasant enough to stay in, most of the eating places here are cheap, simple and somewhat unkind to the untrained stomach. Also, when you make an online booking with a hotel, you can tell what the rooms and the outside look like, but they don’t show you the neghbourhood. 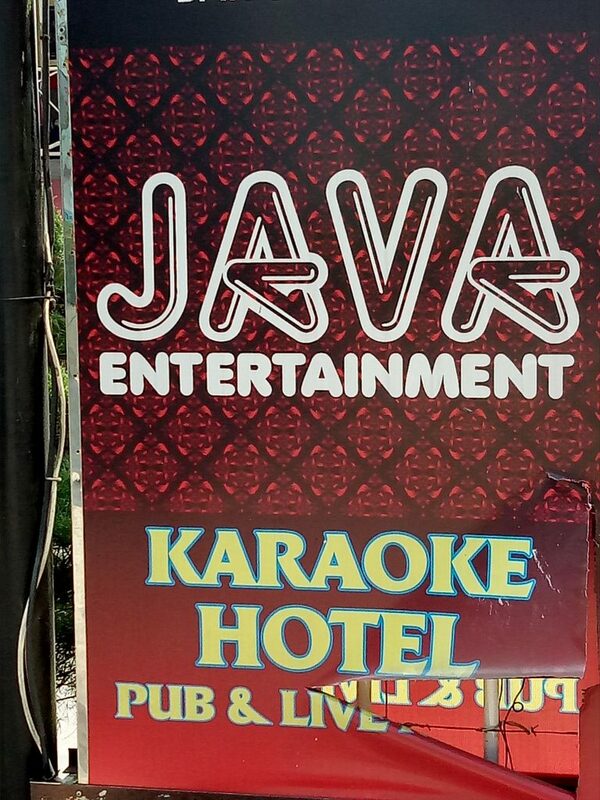 There are numerous karaoke bars at Bandungan and you can be sure that these places have little to do with singing. It’s best to arrive here on a weekday, ride all the way up to the marketplace and scout around for a hotel in the vicinity. You’re sure to find decent rooms in a convenient location. These are mom and pop places not listed online and they are definitely worth checking out. Oh, I ended up staying in a very grand-looking hotel that cost me only $20 a night. As it turned out, the room was dirty and dusty and the fixtures were practically crumbling. There was an unplugged TV in the room and the biggest joke was, I couldn’t find a single electrical socket to plug in the TV or my phone charger!